WHY BUY A UNIQUE DOBERMAN FOR SALE? We have been Doberman owners (or more accurately we've been owned by a Doberman) since 1973. ​After retiring from the cattle and horse industry we've enjoyed breeding a few select litters of German and European Dobermans. It brings us great pleasure knowing one of our precious babies is doing the job for which he was intended... providing you and your family the safest and most effective protection and security available on 4 legs. "The Doberman does not fear, does not retreat, be it human or animal. ​He accompanies his Lord through fire and water - if he is lucky, his master will do the same for him"
Unique Doberman Pinscher Puppies for sale are known around the world as one of the most effective guard dogs for your families protection and companionship available today. Our large boned Doberman Pinscher puppies for sale are thoughtfully bred from Healthy, Long Lived Champion Imported Show and Working line European and German Dobermans. 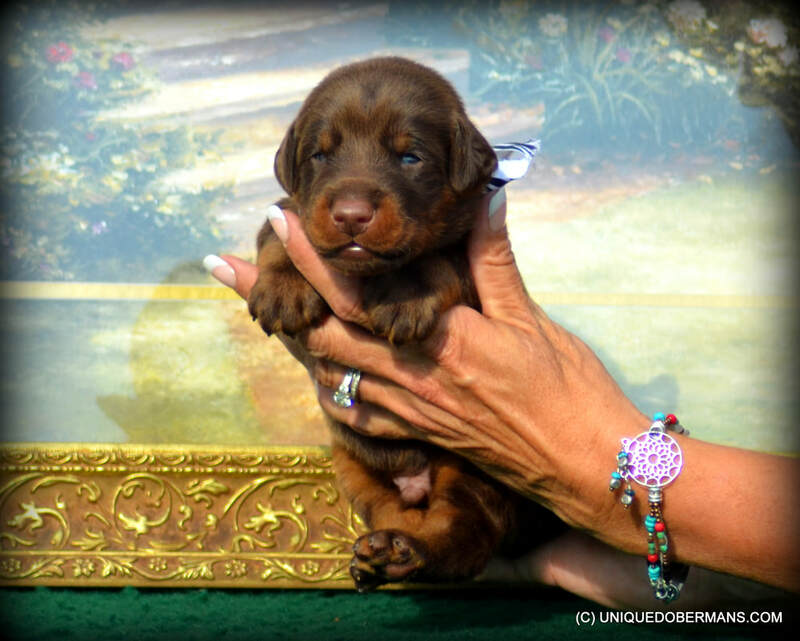 Every Doberman puppy for sale at Unique Dobermans has been thoughtfully and carefully planned and considered long before the breeding has taken place. Your new Unique Doberman puppy (if you are so lucky to be chosen as one of our elite Doberman puppy owners) comes with a pedigree sporting German and European Dobermanns full of world champion show dogs plus each one has been worked to at least a BH in Schutzhund, IPO, Personal Protection sports and competitions. What do all of these Doberman working titles and Doberman show titles actually mean to you as a "pet owner" that doesn't plan on showing your Doberman puppy? EVERYTHING! Your new Doberman Puppy's parents have passed strict temperament testing, tracking trials and personal protection training. The genetics behind your Unique Doberman puppy shows that his genes are free of hip dysplasia, eye diseases, bad temperament and poor conformation. ​A Doberman dog that cannot hold up to the extreme athleticism that is required to obtain working titles is a poorly conformed dog and will break down, a Doberman dog that will not readily willing to obediently obey and have a strong desire to please it's master is not a pleasant Doberman to live with inside the home and certainly will never be able to obtain these titles. If you have been looking for the best Doberman Family Personal Protection Guard Dogs, with a World Champion pedigree, Schutzhund, IPO and VPG Working Titles in Personal Protection, Tracking, Obedience and Agility with Beauty and Brawn to match then give us a call.